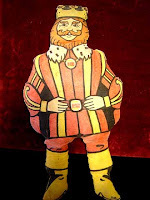 Back when Burger King's mascot wasn't nearly as creepy as he is today, the fast-food chain tried to tout the guy as if he was one of the much more sought-after McDonald's gang. What kid would be thrilled with a pillowy king doll that probably smelled like grilled beef? We're guessing they still have crates and crates of this ill-conceived toy stacked in some Burger King warehouse someplace, Ark of the Covenant-style. Did anybody ask Santa for this chintzy looking thing? "Merry Christmas, Billy. They threw this in the bag when I bought some french fries." Ho, ho, ho...hum. I actually remember having this when I was little (well, if it was Christmas 1977 I was 3). It became one of those stuffed toys my parents put on the bed, but I think the stuffing burst a few years later and it got thrown away.